Wagman Observatory will be open to the public for the Total Lunar Eclipse on Sunday night January 20 starting 10 PM until 2 AM. Totality lasts from 11:41 to 12:44 AM. Mid-eclipse is at 12:12 AM. Guests will also have the opportunity to observe other celestial wonders during this event. The Nicholas E. Wagman Observatory is located in Deer Lakes Regional Park, Frazer Township, Pa., near the village of Russellton in northeastern Allegheny County and some 18 miles from Pittsburgh. Looking to buy a telescope, accessories, star charts and books? Wagman Observatory is the place to start. We’ll have free handouts, guides and booklets to point visitors in the right direction. The Lunar Eclipse Party will be held WEATHER PERMITTING. The public should call 724-224-2510 for more information. Please log in, Register or Reset your Password. All current and past members have accounts created using the email address that was provided to the club. See a region of space where stars are being born, catch a dazzling views of four bright planets, visit the craters of the moon and marvel at our Milky Way Galaxy’s finest clusters and nebulae. 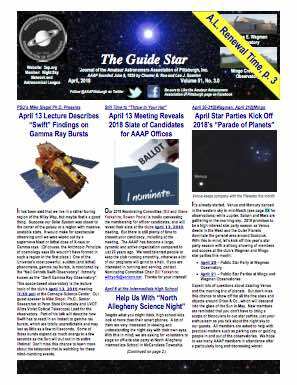 It’s all part of the show during July Star Parties sponsored by the Amateur Astronomers Association of Pittsburgh. . The Star Parties start Friday, July 20 and Saturday, July 21 at 8:45 PM EDT at the Nicholas E. Wagman Observatory in Deer Lakes Regional Park, Frazer Township, Pa., near the village of Russellton, in northeastern Allegheny County and some 18 miles from Pittsburgh.